The AX2000 pushes out a whopping 2000-Watt of peak power. This is the type of power needed to power professional studio monitors, a small stage sound system, a DJ's mobile rig or a lounge or small club's speaker system. It will give you the power you need and also achieve a clear and crisp sound output. The inputs are RCA connectors making it easy to connect any standard equipment. The outputs are Banana Binding Post which are also an industry standard that allow you to connect to almost any speaker system. Connecting to and from this amplifier is a simple task! And the sound quality it provides will make sure your audience knows you are professional using professional audio gear! 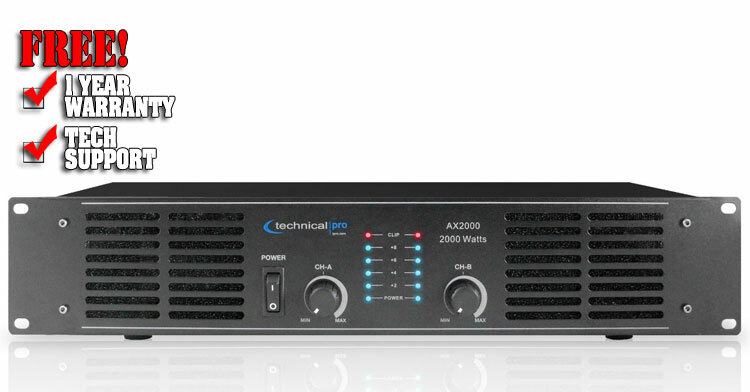 Like all of Technical Pro's amplifiers the AX2000 is built to hold up under pressure. This unit will give you the sound output you need in a crowded club, a stage or in your studio. It can be connected to any standard studio or mobile rack with ease! And it will hold up against the pressure of performing and always set the place on fire! But not literally, the Dual Cooling Fans will keep this unit as cool as a cucumber even under long term use so you won't have to worry about overheating. Racks of professional audio gear or crowded venues and nightclubs are always hot so not worrying about overheating your amplifier is priceless! The front panel of the AX2000 has two knobs for each channel to control the volume level. In addition there are iridescent blue meters to show your level readings. This is not only extremely useful to gauge your levels but also looks very stylish in a dark space! The front panel also holds the power button. This is a very useful feature if you place this unit into a rack...there is no need to climb behind your gear to turn this one on and off! There is also a clipping level feature which lights up red to warn when clipping levels are reached...one fast glance to the front panel and you will see your input is at a proper level.